Formerly known as Five Stars Penang, Komtar Gunung Raya has marked their presence in the states of Penang. 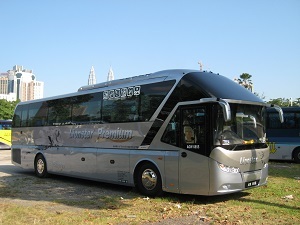 Currently headquartered in Prangi Mall, Georgetown, this bus operator provides routes to and from Penang to numerous popular destinations, including, Cameron Highlands, Kuala Lumpur and even as far as Singapore. CatchThatBus offers online bus tickets to many routes covered by Komtar Gunung Raya as well as seat availability features. You can book your bus ticket online from our website or via mobile app which can be downloaded for free on Google Play or App Store.